A Truly Timeless New York City Boutique Hotel Recently renovated the Hilton New York/East Midtown is a quintessential New York City boutique hotel and landmark offering contemporary accommodations and modern amenities in a 1931 historic neo-gothic tower. Situated on famed 42nd Street in Midtown Manhattan this 300 room classic New York luxury hotel is anchored by Grand Central Terminal United Nations and Tudor City a historic landmark residential enclave. 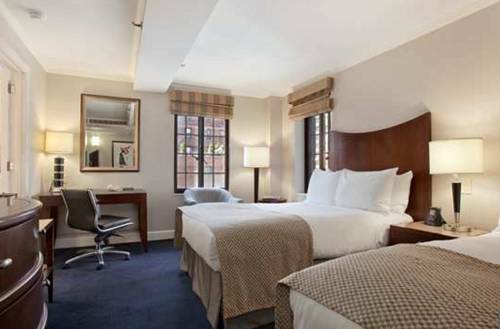 Enjoy a timeless New York experience in this friendly and peaceful New York City Gem. Location At the corner of 42nd Street and 2nd Avenue in Midtown Manhattan. Steps from the United Nations headquarters Grand Central Station and the Chrysler Building. Short distance to Times Square Fortune 500 companies and New York*s finest shopping dining attractions and site-seeing venues. La Guardia Int*l Airport 8 miles 30 minutes. Accommodations Newly renovated guest rooms and Suites traditionally detailed some offering private terraces and spectacular views. Each accommodation features 42 LCD flat-screen TV in-room movies dual-line telephone wireless high-speed Internet access in-room computer coded safes handsome marble bathroom and generous closets. State-of-the-art fitness center 24-hour business center full-service concierge and valet. Dining The Tudor Neighborhood Bar - Grill located at the south end of the hotel lobby serves an enticing daily breakfast as well as continental American cuisine and international specialties for lunch and dinner. The Lobby Lounge offers light fare and specialty drinks. Room Service is available for your in-room dining pleasure. Meeting - Events 3 500-square-feet of event space encompassing 3 function rooms and 2 Executive Boardrooms with capacities ranging from 8 to 200 guests. State-of-the-art audiovisual equipment professional event staff and fully equipped business center. Reservations must be cancelled 48 hours prior to hotel time of arrival to avoid penalty. 50.00 USD early departure fee. Breakfast Buffet with Herb N* Kitchen is open each morning from 7a-11a. Featuring a classical spread of fruits pastries meats and multiple hot options coffee hot chocolate juices etc. Hilton*s new concept restaurant Herb N* Kitchen features seasonal soups salads artisanal sandwiches and pizzas. A barista zone offers specialty coffees to enjoy either in the restaurant or on the go.